Now that we’re done with New York Fashion Week outfits, we’ll move onto my Carmel outfits! I picked up this simple shirtdress at the Rebecca Taylor boutique in the Meatpacking District and knew it would be an instant classic in my wardrobe. It’s a great wear-now piece because it looks great layered with a sweater, but I can’t wait to wear the dress by itself with some colorful jewelry and sandals come summer! I wore this ensemble to lunch at Village Corner Bistro, where I had the most delicious calamari steak sandwich – did you see my Instagram? Definitely going back there the next time I’m in Carmel. After lunch we stopped in sister stores Girl Boy Girl and Paloosh where I picked up this Anine Bing dress (in a light purple/white combo) and a beautiful navy A.L.C. trench. These ASH booties are also a recent acquisition, as I’ve been needing a comfortable and wearable black bootie. They’re under $200, so it was an easy decision to make. 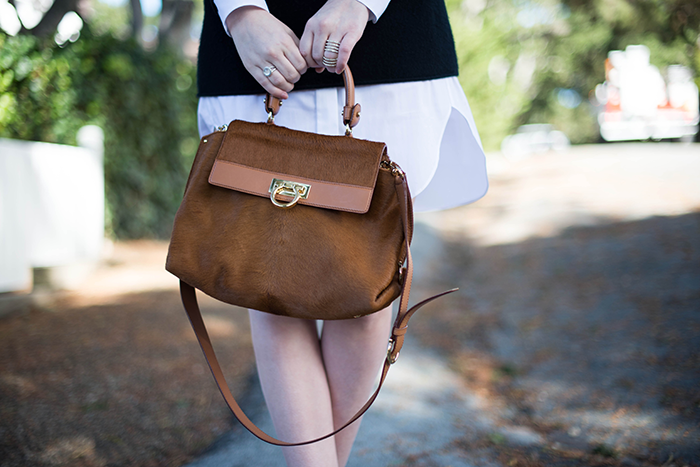 Love this classic look, and great bag! 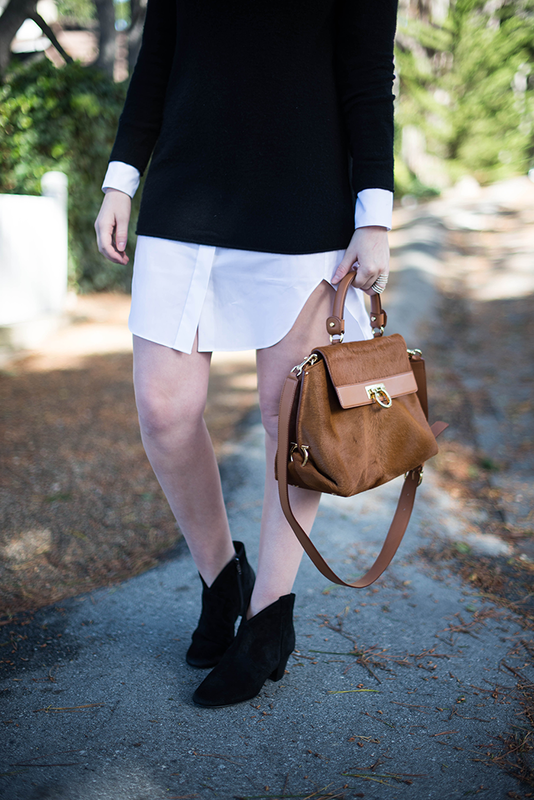 Nothing is more classic than a simple shirt dress. Love how you layered it! love this basic look, that dress with the sweater over it looks relaxed yet put together at the same time! Always so chic! That dress will look darling with the Loeffler Randall sandals of yours that I’m coveting! Oh, summer, where are you? amazing look! I absolutely love it all. That bag is totally gorgeous and I love your booties too. I would never think to wear a shirt dress with a long sweater, but I love this look on you! Those booties are pretty fabulous too, and love the shape of those sunglasses! 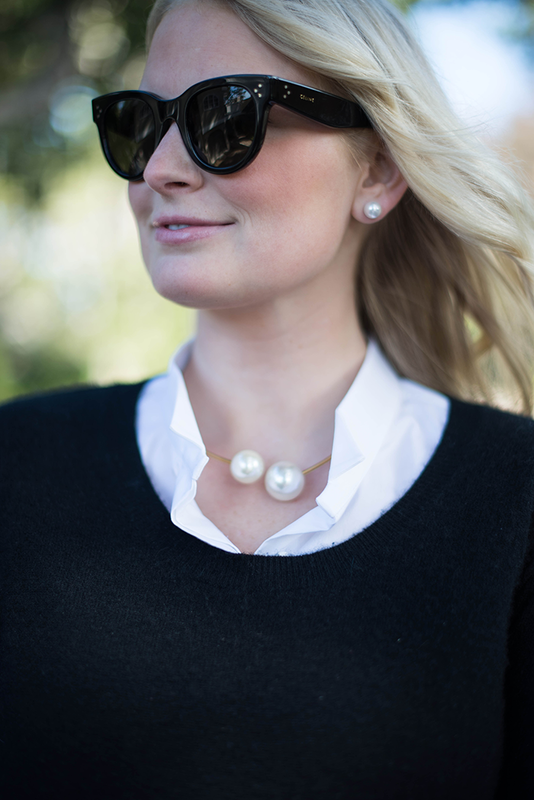 Such a great, classic look! I really like the sweater, shirtdress combo. such a lovely look! the ferragamo bag is so gorgeous, loved shopping at their beyond chic store in rome. That bag is so lush! 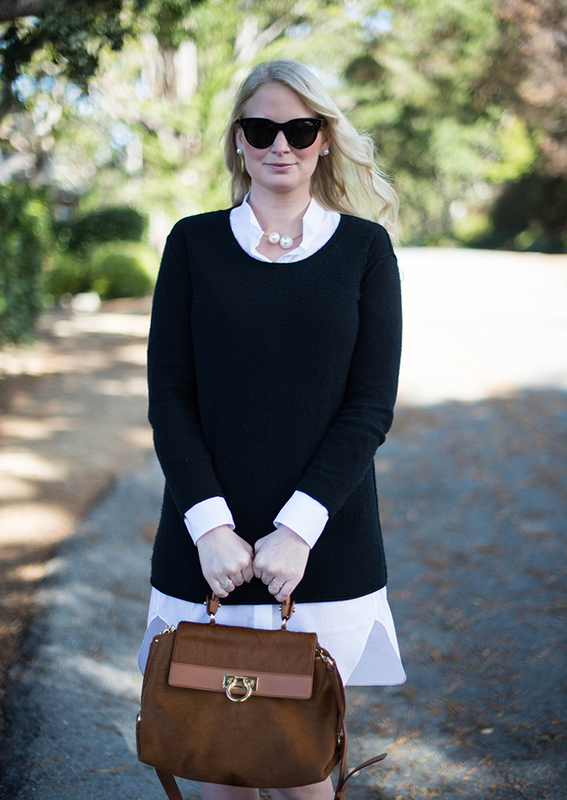 I love the sweater over the shirt dress… great for transitioning into spring! Lovely. I’m a huge fan of classic outfits. Love this layered look and that bag is such a beauty! Loving this laid back look. Especially the calf hair bag! I’ve been looking for a good shirt dress, the new wang one was no bueno on me! I want your collection of handbags!! I know I’ve seen this one before, but I feel like every post I read makes my handbag wish-list just a little longer! Carmel looks amazing! love this- i’ve been on the hunt for some shirtdresses! Beautiful! 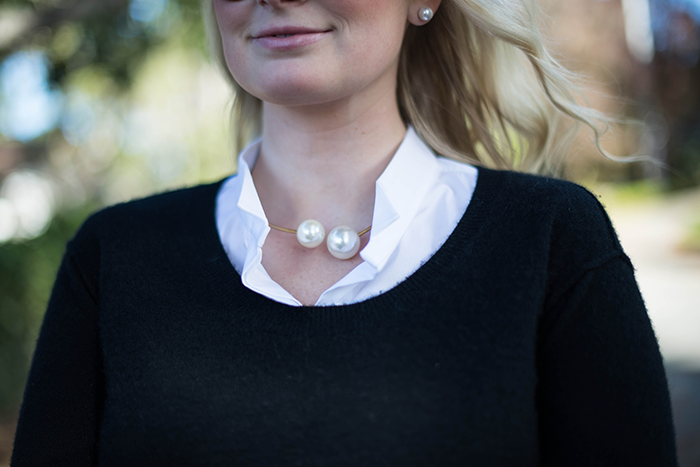 LOVE that pearl necklace! Gorgeous look, LOVE the purse! You can never go wrong with classic black and white. Love the black booties, too. Loving your use of the shirt dress! I love this look! So clean, classic and elegant. Shirtdresses are so hard to wear, but you’ve really sold me on this! Love a pretty shirt dress and those Celine glasses are gorgeous! I just bought a pair this weekend! Lovely outfit! I’ve been in the market for some black booties, and these Ash beauties are the answer. They look comfy and stylish for half the price of their Rag & Bone equivalent. Great find, Merritt! love this outfit! The dress / sweater combo is amazing! I love that chocker, an affordable option to the Chanel one! I love that shirtdress. And it looks so good with the sweater layered over. So cute!